There are numerous, obvious solutions to problems in Afghanistan which NATO countries could consider, could even attempt if the alliance wasn’t there for the mineral wealth. In an October 29th speech, in Brussels, Stoltenberg commended NATO Allies and partner nations from across the world because, for over a decade, they “stood shoulder to shoulder with Afghanistan.” According to Stoltenberg, “this international effort has contributed to a better future for Afghan men, women and children.” Rhetoric from NATO and the Pentagon regularly claims that Afghans have benefited from the past 13 years of U.S./NATO warfare, but reports from other agencies complicate these claims. 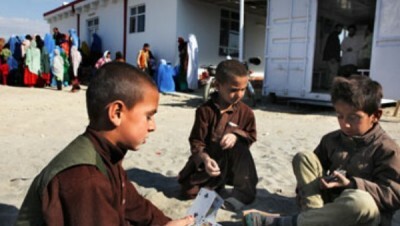 “It is particularly alarming that the number of Afghan women and children killed and injured in the conflict increased again in 2013,” said the UNAMA Director of Human Rights, Georgette Gagnon. I wish that NATO’s commander could have joined Afghan Peace Volunteers (APVs) that same week, in Afghanistan, as they visited an extraordinarily sustainable project, called “Emergency.” This Italy based network of hospitals and clinics has been particularly remarkable for effectively saving and improving the lives of Afghan people, over the past 13 years, while at the same time rejecting any form of war or use of weapons within its facilities. At the entrance to any one of Emergency’s clinics or hospitals, a sign says “No Weapons Allowed.” A logo banning guns is next to the Emergency logo. Although they work in one of the most intense war zones in the world, Emergency staff, including security guards, reject any use of weapons inside their facilities. They’ve learned unarmed ways of providing security. One such way involves an absolute commitment to neutrality. They never take sides in the various conflicts that plague Afghanistan. In fact, they don’t even ask if a patient belongs to one side or another. Luca says they acquire security through their reputation. Since they never charge any patient for health care, no one would accuse them of trying to make a profit. If NATO and U.S. commanders took a fraction of what they have spent securing this region by violence,- (the Pentagon has requested 58.5 billion dollars for Fiscal Year 2015 in Afghanistan),- and spent that instead on helping heal people from war and from war’s causes, providing, say, chances at a survival wage that don’t require enlisting with the local Taliban or the local warlord, sending enough food for the families war has displaced instead of weapons donated this month to one faction, next month to another; if a portion of the 104 billion the U.S. has spent on non-military aid to Afghanistan, since 2001, could have subsidized actual food crops so that poor farmers disgusted with their subsistence role in poppy production could somehow survive without it, could non-combat projects start to work, as have Emergency’s projects? There are numerous, obvious solutions to problems in Afghanistan which NATO countries could consider, could even attempt if the alliance wasn’t there for the mineral wealth, for another foothold on which to stand between once-and-future superpower rivals and the world’s oil. The world looks so much different when you’re in it to make a profit. But Emergency isn’t in Afghanistan to point out a sane path through disaster to all the actors, here and abroad, who seem unlikely to discard paths of suicidal hatred and ignorance. We might address a similar question to NATO Sec. Gen. Jens Stoltenberg: A new, non-combat mission, in Afghanistan, one that rejects weapons and war—what would be so complicated?